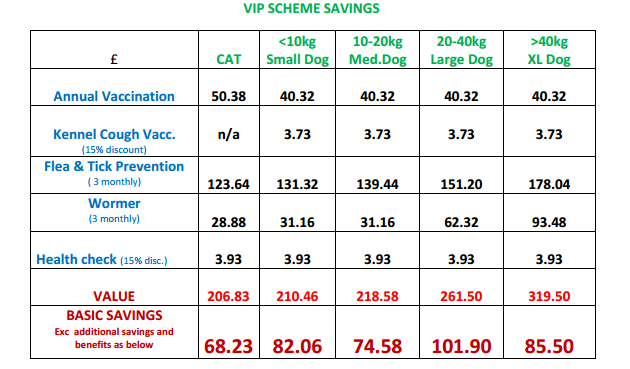 Our Healthy Pet Scheme has been specifically designed to provide annual routine preventative healthcare, which your cat or dog will require throughout the year at a discount, i.e. vaccination, worming and parasite treatment. At present, the majority of pet insurance policies do not cover preventative healthcare. Your pet will be invited to twice-yearly health assessments (puppies and kittens will be invited to attend quarterly assessments) at which point you will be given the next three/six month’s supply of flea/worming preparations. It is therefore very important that you attend the Health Assessments, as this is the only way in which you can obtain the above products. For Dogs - Distemper, Parvovirus, Hepatitis and Leptospirosis. For Cats - Feline Enteritis, Flu and Feline Leukaemia Virus. Whether you are starting a full vaccination course or renewing your booster, you will be entitled to a 15% discount off the normal price and your next booster will be covered in full by the scheme. (After the qualifying period). Our product of choice is a prescription-only medication that treats both roundworms and tapeworms; this should be administered every 3 months (more frequently for puppies and kittens). We have taken into account recent research and current recommendations and are now using a market-leading, exceptionally effective prescription product. This only needs to be administered once every 3 months and provides protection against both fleas and ticks. The cat preparation is a spot-on product which avoids the necessity of 'tableting' your cat. Joining the scheme is easy – just come down to your local surgery and complete a registration form, which should only take a few minutes. Your bank details will be required to set up a direct debit to join the scheme. If you require any clarification regarding our VIP scheme, please do not hesitate to speak to one of our staff, who will be able to explain the scheme in more detail. All of our contact information can be found here.